Damien Chazelle is only 29 and somehow he's managed to direct one of the most interesting and exciting movies of the year. 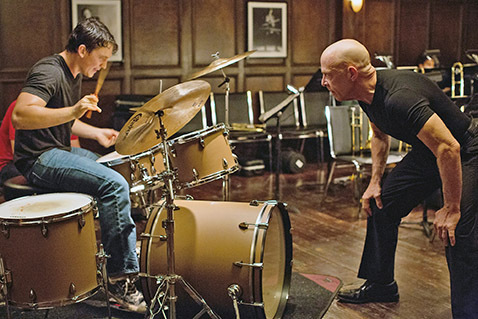 Whiplash is the fictional account of Andrew Neiman (played by Miles Teller), a 19-year-old jazz drummer who is accepted into the Shaffer Conservatory, the best music school in the United States. Neiman ends up getting involved with an acclaimed music teacher named Terence Fletcher (played by the always entertaining J.K. Simmons) who leads an exclusive jazz music club within the school. We quickly find out that Fletcher is very harsh and aggressive in his instruction, pushing the timid Neiman to the brink at times and cursing up a storm along the way. Fletcher feels that tough love and criticism is the key to pushing people to greatness. Whiplash shines as a great example of the price of perfection. In order to be the very best at something (which Andrew desperately wants to be) you have to be immersed in your craft, practice constantly and sacrifice outside relationships, responsibilities and sometimes your own health. What Chazelle does well in this movie is to leave the discussion up to the audience. How far would you be willing to go to be the best at something? Simmons is the star of the show in a supporting role, playing the fiery individual he was born to embody. All of the quick wit we've seen from him in Spider Man, Juno and countless other roles has been turbocharged and spit back in our face in the form of a bald agro-freak wearing a tight black Simon Cowell t-shirt. Every time Terence Fletcher is on-screen we are fixated on him and wondering how far he'll go in his teaching/abuse of Andrew. Teller has the tough task of going toe-to-toe with this one-man wrecking crew and holds his own quite nicely. The speed with which he executes his drumming towards the end of the film is mind-blowing. To be able to perform at such a high physical level, it's incredible that he's also able to show his character's arc moving from a timid music student to someone who stands up to his instructor and exudes confidence. Chazelle makes everything tick perfectly with his direction. He turns ordinary jazz performances into full-on boxing matches between Fletcher and Andrew. From the close-up shots of shiny instruments in motion to the dripping blood on the drum kits unleashed by Andrew's furious drum solos, the act of musical performance is turned into a quasi-gladiator blood sport. I'm not a big fan of jazz music, but the rat-a-tat-tat drumming and horn blowing gets a hold of you as a viewer and at the end of the film I was all-in on the soundtrack. I ended up listening to some of it in the car the next day. This movie seems so simple in premise but is executed so flawlessly that it stays with you for days after seeing it. Whiplash is so tense and fast paced that it's over in a flash. Credit Chazelle with excellent pacing and his quick-cut approach to the music sequences. I had no idea that a movie about a jazz band could be so interesting and infectious. You need to go see this film by all means necessary and preferably before Oscar night (I do think we'll see a Best Picture nomination for this film despite the Golden Globe snub). This is simply one of my two favorite films of 2014 and earns my second 5 out of 5 JR rating. Teller and Simmons are electric and make Whiplash a true joy to watch. NOTE: expect my much-delayed year-end Top Ten post at the end of next weekend, when I hope to see American Sniper and The Theory of Everything to round out my 2014 films. This film has the best ending of a movie for this year. It has the most emotionally powerful last 10 minutes I've seen so far in 2014.